A lot of birders and wildlife watchers have trouble identifying the "peeps" and other sandpipers. 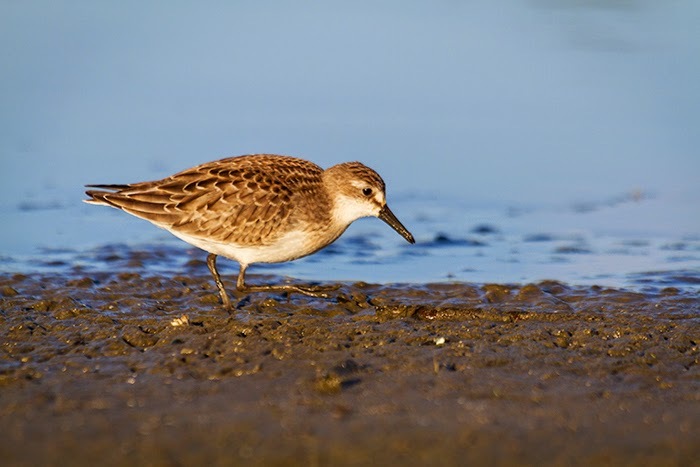 They can be quite tricky, particularly species like the Semipalmated Sandpiper and its close relative the Western Sandpiper which are very similar in appearance, and in which even some of their more distinctive features overlap somewhat. 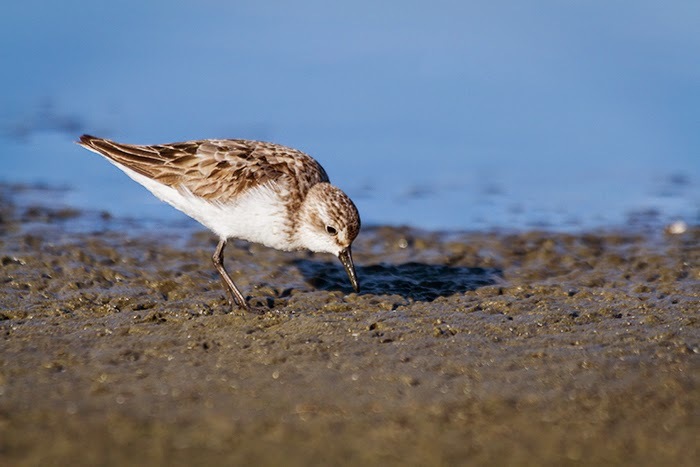 In fact during fall migration, it can often be easier to age a sandpiper than to determine its species. Take for example the two semipalmated sandpipers below, photographed at the beginning of September at Jamaica Bay NWR in Queens, NY. 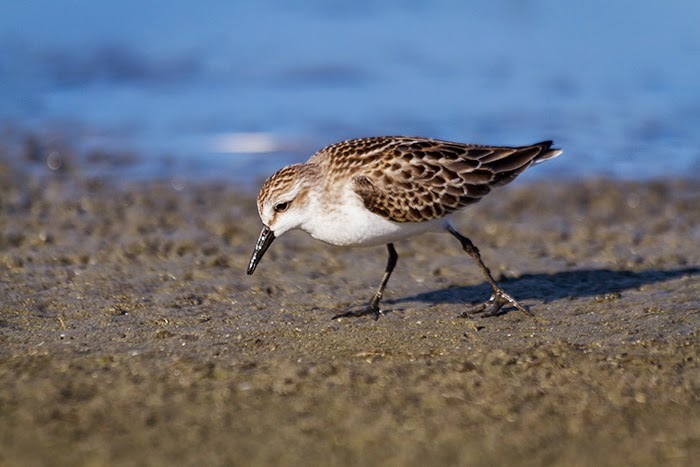 A juvenile Semipalmated Sandpiper. Notice the rounded feathers with broad buffy edges. 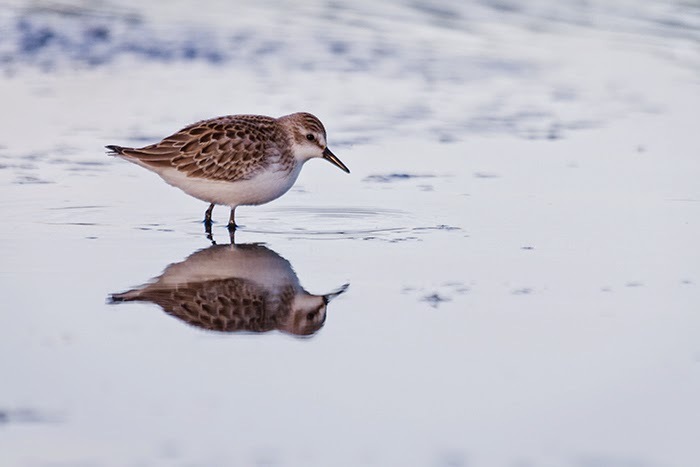 An adult Semipalmated Sandpiper. Notice the worn triangular appearance of the older feathers with no buffy edges and contrast them with the new paler winter plumage feathers. In the first image of the juvenile, notice first the overall "scaly" appearance of the back due to the bright buffy (can vary from white to more rufous) colored edges on each feather. Looking closer at each individual feather, notice that they are rounded and fresh looking. Notice in particular the wing coverts, the small feathers covering the upper parts of the long wing feathers (primaries). Now contrast with the adult Semipalmated in the image below it. In this case the bird has already begun to molt into its winter (or basic) plumage, giving it a salt and pepper look, with the dark summer (or alternate) plumage feathers contrasting with the paler ones. Looking closer, notice that the old darker feathers are worn, jagged, and triangular looking, and mostly or completely lacking the broad distinctive buffy edges that the juvenile feathers have. Notice that the newer pale winter feathers have a more rounded appearance and white-buffy border more reminiscent of the juvenile feathers. Again notice the wing coverts, which tend to show a lot of wear and tend to be molted later. Here are some more images of Semipalmated Sandpipers from the same day in different light. See if you can identify which ones are juveniles and which ones are adults, using what you've learned. Feel free to leave your answers in the comments section and I'll let you know if you are right. 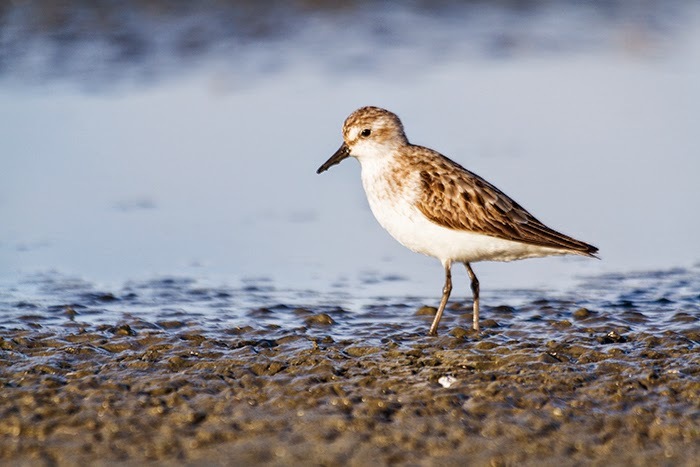 My last installment of the Peep Show will cover the Western Sandpiper, a species that is often confused with the Semipalmated.